An air conditioner that does not produce enough cold is unpleasant and an indication that it is due for regular aircon servicing. The following are some of the top air conditioner problems that face the people of Singapore and their maintenance tips that one can carry out on his own. Before looking at other problems that could be making your air conditioner not to work properly or blowing warm air, one can undertake simple aircon maintenance tips like checking the vents of the air conditioner in every room. Dust, dirt, or any other blockages can lead to a reduction in the amount of air that circulates the room, hence leading to the release of warm air. All that could be needed in order to solve this problem is to clean the air conditioner filters thoroughly. A dirty filter of the air conditioner could be the reason why it is producing warm air. The air conditioner filters should be checked regularly and if need be washed as a part of routine and regular maintenance. Always remember to turn off power on the air conditioner whenever you are starting any maintenance work of the air conditioner. A flow of air that is limited is caused by blocked vents or air filters and can lead to a drop in the temperatures of air conditioner evaporator coils to an extent that they end up icing up hence reducing the effectiveness of the air conditioner. One can easily see the ice that is on the coils if that is the case. Basic maintenance of the air conditioner by cleaning the filters and the vents can improve on its efficiency. 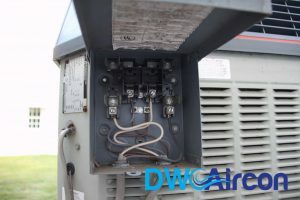 A problem in the disconnect box could be the reason why an air conditioner is not producing the right temperatures. A multimeter is required in order to test the fuses in the box which are two and also some understanding of electricity is required. 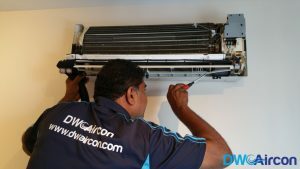 In Singapore, one can contact DW aircon servicing company for a technician if they are not comfortable working with electricity. The evaporator needs to be cleaned on a yearly basis as a part of the routine maintenance of the air conditioner. This is meant to reduce any chances of inefficiency. When the inspection and the insulation hatch are removed, the evaporator and the tray that is beneath should be cleaned hence leaving the air conditioner to operate effectively for another whole year. 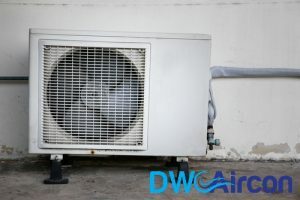 If you are in a house on the ground floor in Singapore that has trailing grass, weeds, or any other plants that are known to grow swiftly, you should ensure that the outside unit of the air conditioner is protected. This can be done by pruning and mowing regularly as the undergrowth will start to affect the functioning of the air conditioner and its lifespan. This does not require any special equipment and can be done easily by anyone at any time. You should also always ensure that these surroundings are clean and nothing interferes with the compressor unit. 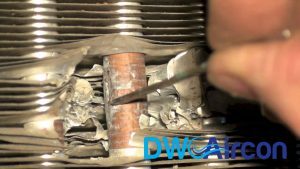 There are many parts of the air conditioner that can be maintained and cleaned without assistance from technicians, but parts like the compressor will require professional assistance from aircon servicing technicians who know what exactly they are doing. This provides a thorough cleaning of the air conditioner and flushing the bacteria and germs out. This is the most famous aircon service package in Singapore that we offer and is highly recommended to homeowners who have pets and kids. An aircon chemical overhaul is a perfect deep cleaning of the whole air conditioner for the AC units that are dirty and old. Aircon servicing is highly recommended for older air conditioning units that need comprehensive maintenance. This includes cleaning of the blower wheel, filters, panels, fan blade, indoor evaporator coil and flushing of the drainage system of the air conditioner. Aircon servicing provide installation services in Singapore to offices and residential homes. These aircon services include installing new air conditioners and replacing the old units.